Beginning with the epic Ia Drang Valley battles in November, 1965, a communist dry season offensive in the Central Highlands had become something of an annual ritual. The NVA’s Central Highlands (B3) Front, which controlled NVA/VC activities in Kontum, Pleiku, and Dar Lac provinces of South Vietnam, could muster on the order of 15,000 troops in three infantry regiments subordinate to the 1st NVA Division, plus another three independent regiments. A dedicated artillery regiment provided fire support in the form of 122mm rockets, 120mm mortars, and 75mm recoilless rifles. Countering this force was the U.S. 4th Infantry Division and its attached units, headquartered at Camp Enari, just south of Pleiku City. At or near Dak To were two 4th ID battalions, plus a battalion of the 173d Airborne Brigade under the operational control (OPCON) of the 4th ID. Army Security Agency radio research units did of course play a major intelligence role, perhaps including ARDF, in the short but violent Dak To campaign but the contributions of the EC-47 crews from Detachment 1 of the 6994th and the 361st TEWS remain unheralded. The Det. 1 history for July-December 1967 provides a brief yet fairly detailed account of ARDF close tactical support in what was to be one of the most bitterly contested battles of the war. Allied intelligence was already aware of the identities and general locations of most of the enemy units which would shortly become involved in the Dak To battles. On 14 October, Det. 1 fixed the headquarters of the 24th NVA Regiment, previously located in I CTZ, at a point northwest of Dak To. Two days later the HQ of the 32d NVA Regiment was fixed, still in Laos but some 18km from its last known location. The 32d was also heard in communication with the 1st NVA Division for the first time in several days. On or about 16 October the 1st Division HQ was also fixed, having moved some 68km (42 miles) north-northeast from its last known position in Cambodia. On the same date, a military intelligence unit associated with the 1st Division was fixed just across the border in Cambodia. A week later that unit was located southwest of Ben Het, now evidently collocated with the 32d NVA Regiment HQ, which had also moved. On 2 November a defecting NVA sergeant told the Americans that an attack planned for a few days earlier had been postponed. Meanwhile, two-a-day EC-47 missions continued to keep tabs on enemy radio communications which on 4 November virtually ceased, a dead giveaway that hostilities were imminent. Having confirmed that the NVA soldier’s story jibed with ARDF and other intelligence, the U.S. commander initiated preemptive action, air assaulting one battalion into a line of hills south of Dak To known as “Rocket Ridge.” A second battalion helicoptered on to another line of hills a few miles to the west. This move may in fact have disrupted the enemy's plans. No attack on Dak To occurred; instead the North Vietnamese troops burrowed into defensive positions among the hills to the south to await the inevitable American "search and destroy" sweep of the area. In two days of heavy fighting, the inserted U.S. battalions found their heavily armed foe ensconced in mutually supporting bunkers covered with thick mahogany logs which only a direct hit by very heavy ordnance could penetrate. The trees had been laboriously felled and sawed by hand, put in place over a period of days or weeks. The NVA was obviously ready for a long, hard fight. By 5 November the situation was judged serious enough to have two more battalions of the 173d airlifted to Dak To the next day. On the 6th, EC-47 crews fixed the headquarters of the NVA 1st Division, which had now crossed into South Vietnam. At the same time, the military intelligence unit believed to be attached to the 1st Division was tagged southwest of Dak To, a move of several kilometers from its previous position. The 24th NVA Regiment was fixed to the northwest, 15 kilometers closer than its last known location. (See map above.) The U.S. command now divided the battlefield. 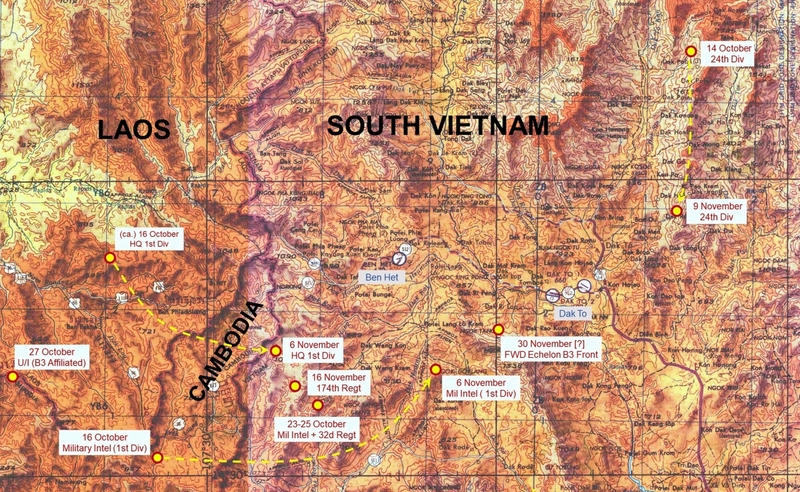 To the northeast, ARVN troops would take on the 24th NVA should the communists try to interdict the route to Dak To. The 4th ID would continue the fight in the eastern Rocket Ridge area while the 173d dealt with the western zone south of the Ben Het camp. Over the next four days, there would be plenty of action in both sectors. On the eastern wing, the 4th ID’s loses were heavy. After a particularly hard day, some rifle companies could muster less than fifty fighting men; the largest would number just 78. By 11 November one entire U.S. battalion was rendered close to combat ineffective. “As far as brutal fighting goes,” admitted MG William R. Peers, the 4th Infantry Division commander, “I would say this is the worst we’ve had.” But devastating air strikes and artillery finally forced the enemy to give way. The battered NVA began to slip out of their bunkers and head west towards their long-established sanctuaries. In the midst of this carnage, Gen. Peers saw an opportunity to cut off the enemy before he could cross the border. Two battalions of 173d marched into the hills south of Ben Het, aiming to do just that. Perched somewhere on the right flank of this movement was the 174th NVA Regiment, it’s location still unknown. An EC-47 mission would fix the regimental HQ transmitter on 16 November, although a POW had confirmed the unit's presence a few days earlier. (See map.) Three days of hard fighting cleared the way further south, but at a stiff price. In one U.S. company, “only a handful” of men remain unscathed. Twenty-six and been killed, another 154 wounded. On 18 November two battalions of the 173d pushed on to the southwest, hoping to block the enemy withdrawal, which now appeared to be in earnest. A Montagnard scouting party was pinned down at the base of a steep hill noted simply as 875, that being the height of its peak in meters. The next day, three companies of 2d Battalion, 503d Infantry (Airborne), began to work their way up the slopes of Hill 875. Around 10:30 am a deadly hail of enemy fire stopped the advance. As casualties began to mount, the Americans pulled back and called for air and artillery. After a half hour of non-stop blasting the grunts moved out, overrunning one line of bunkers, only to be stopped again further up the hill. This charge forward-pull back battle raged until early afternoon when a violent surprise attack from the west drove a wedge through the American platoons strung up and down the hillside. By about 3:30 pm, however, the three companies of 2/503d managed to join up and form a defensive perimeter. They were essentially surrounded, with many wounded, and running short of water and ammunition. When the shooting tapered off around 7:00 pm, forty Americans had died in eight-plus hours of the most vicious close-quarters fighting imaginable. Forty-two were wounded, another 32 were missing. Then suddenly an already bad day got worse. An air force F-4 Phantom, called in for close air support, dropped a 750 lb. bomb squarely in the midst of the American position. Officially, 42 G.I.s were killed by the blast, but a writer from the 173d maintained that the actual count was at least fifty. But the enemy, as always, had if anything been even more brutalized. The American battalion held out through the night with relatively little interference as reinforcements began climbing up the hill. On 20 November the fourth battalion of the 503d, thrown into the battle the day before, tried its luck. Results were no better, the Americans pulled back and hunkered down. A recommendation to blow the top off Hill 875 with B-52 strikes was rejected. For safety reasons an even greater pull-back would be required; the U.S. commander feared his quarry would escape in the interim. The troops would stay where they were. In three days, 2d and 4th Battalions lost another 86 men. At first light on 23 November—Thanksgiving Day—two battalions of the 503d and one from the 4th ID again trudged up the incline. The surprisingly minimal enemy resistance was swept aside, and around 11:30 battle-weary troopers of the 173d Airborne Brigade stood unmolested atop Hill 875. Helicopters brought in hot Thanksgiving chow. "It was," one soldier remarked, "the best meal I ever ate." Sniper fire, brief skirmishes, and random shelling continued over the next week or so, but the battle for Dak To was essentially over. As always, the enemy had taken tremendous punishment, much of it from U.S. artillery and TacAir. But the devastation unleashed by hundreds of supporting ARC LIGHT sorties proved to be the most fearsome. Nonetheless, the 1st NVA Division, though badly bloodied, was far from finished. The decision to withdraw was likely dictated as much by supply shortages as by the number of casualties sustained. Any NVA offensive relied on ammunition, food, and other necessities hauled along the Ho Chi Minh Trail then laboriously pre-positioned weeks or even months in advance. When stocks were depleted the enemy disengaged and slipped back into his sanctuaries, generally before U.S. forces could mount any effective pursuit. As the fight wound down between 23 and 25 November, Electric Goon crews fixed the 32d NVA Regiment and an NVA Military Intelligence transmitter. By this time these units were apparently withdrawing. The Detachment 1 history also shows a fix of an otherwise unidentified element of the B-3 Front as being made on 30 November. (See map.) This is the closest to Dak To of any listed fix and, if the date is correct, makes it somewhat puzzling. Was the enemy transmitting his own After Action Report from within observation distance of the American base, or perhaps gaging when or how a future attack could be profitably launched? Coincidentally or otherwise, the next day a fire support base near Ben Het received “a heavy 82mm mortar and 122mm rocket attack” that killed one G.I. and destroyed a 155mm howitzer and a ¾ ton truck. In looking at the role played by ARDF in the Dak To battles, several things must be kept in mind. First, the 6994th histories cited here were compiled and written some four month after the action described, based on reports and data forwarded by Det. 1 on a daily or weekly basis. Second, the fixes listed are undoubtedly just a fraction of the total made during the month-long campaign. Why the historian chose these particular items cannot be determined fifty years later. ARDF apparently failed to detect the 66th NVA Regiment altogether, although that unit may have been so closely aligned with the 1st Division HQ that it had little need for separate radio communications. As was the case in virtually every supported ground operation, ARDF provided the primary targeting intelligence for B-52 strikes which “struck known base areas, infiltration routes and strong points.” But probably the EC-47 team’s most significant contribution to the campaign was in the early warning stages when ARDF detected and identified enemy forces moving toward Dak To, thus alerting allied commanders to the danger and enabling them to place their forces in the most optimal positions to meet or preempt an attack. It also seems reasonable to assume that ARDF was the sole intelligence sole source capable of narrowing down thousands of square miles of territory into areas where other methods and platforms could be successfully utilized. As for the battle itself, aside from killing and maiming hundreds of the enemy, neither side could claim much. Hill 875 had no strategic value. Furthermore, “friendly fire” had taken an unusually high toll of American lives. In addition to the “short round” dropped the by the USAF F-4C, “misplaced indirect fire and shooting of men wandering in front of friendly positions” killed others. By one estimate from the 173d, almost 40% of U.S. fatalities were self-inflicted. As news of the battle appeared on TV screens back home, viewers—and even some in the military itself—increasingly began to question the wisdom of COMUSMACV's body count strategy.